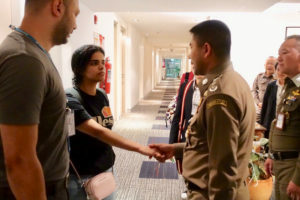 BANGKOK — Australia’s government said Wednesday that it will assess the resettlement case of a Saudi woman who fled from her family now that the United Nations has deemed her a refugee, taking the woman’s high-profile quest for asylum a step forward. “If she is found to be a refugee, then we will give very, very, very serious consideration to a humanitarian visa,” Health Minister Greg Hunt told the Australian Broadcasting Corp. before the UNHCR’s referral. The case has highlighted the cause of women’s rights in Saudi Arabia. The case has highlighted the cause of women’s rights in Saudi Arabia. Several female Saudis fleeing abuse by their families have been caught trying to seek asylum abroad in recent years and returned home. Human rights activists say many more similar cases will have gone unreported. The influence of the Internet on Alqunun’s case was noted by several human rights advocates. Thailand’s immigration police chief Lt. Gen. Surachate Hakparn said that Alqunun’s father and brother arrived together in Bangkok on Tuesday but Alqunun refused to meet them. Saudi Arabia’s wider human rights record has come under intense scrutiny since the killing of Saudi writer Jamal Khashoggi. A Tuesday statement from the Saudi Embassy in Thailand denied interfering in Alqunun’s case, and said it was only monitoring her situation. Describing her case as a “family affair,” it said Saudi officials had neither seized her passport — as Alqunun had claimed several times — nor demanded her deportation back home. Saudi Arabia’s wider human rights record has come under intense scrutiny since the killing of Saudi writer Jamal Khashoggi in October. Khashoggi, who wrote critically of Crown Prince Mohammed bin Salman in columns for The Washington Post, had been living in self-imposed exile before Saudi agents killed and dismembered him inside the Saudi Consulate in Istanbul.